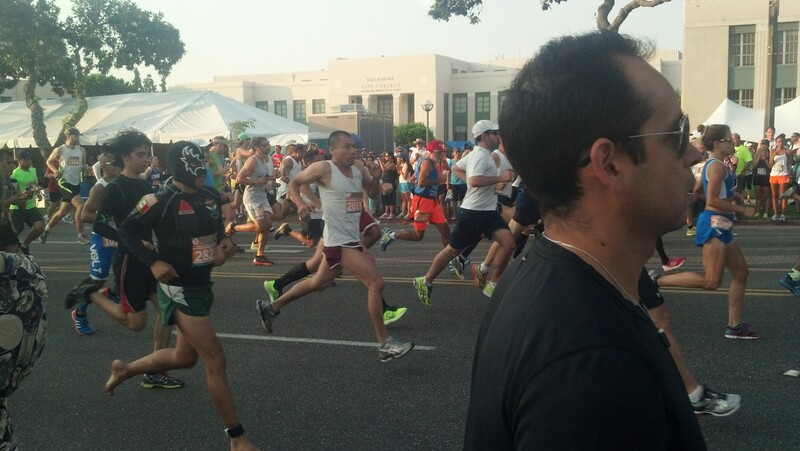 Yesterday, I set a new 10K PR at the Pasadena Marathon’s 10K race! Yes, I’m still pretty happy about that a day later. I didn’t finish as fast as I had hoped. However, you can’t be too disappointed about going faster than you’ve ever done in any particular distance. This race was an important one for me for a few reasons. First, it was in my hometown (and the starting line was literally 10 minutes from where I live). 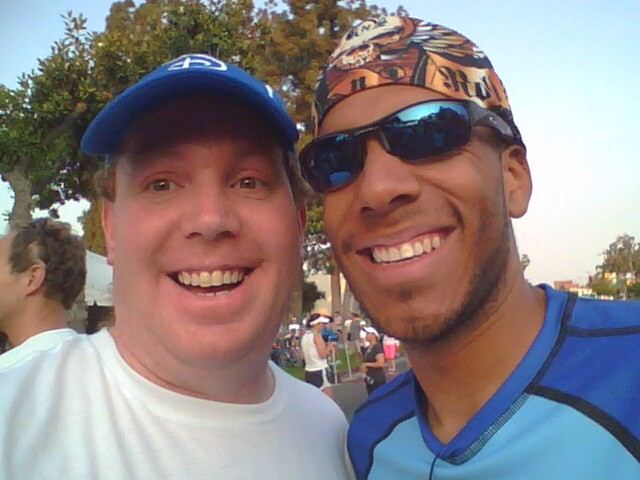 Second, the race happened in the exact middle point of my training for the Disneyland Half Marathon Weekend. Third, last year, I PR’d running the 5K at this race. Fourth, with my training so far for Disneyland, I knew that a PR in the 10K distance was well within grasp. 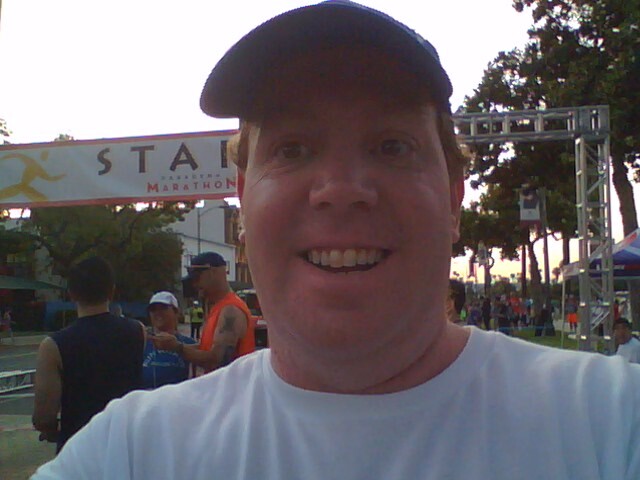 Lastly, this is the last race for me by myself before running the Disneyland Half Marathon. I will be running the Awesome 80’s run on August 24th and the Disneyland 10K on August 31st. However, both of those races will be run with my wife who goes a little slower than I do. So, they will be different kinds of races for me. 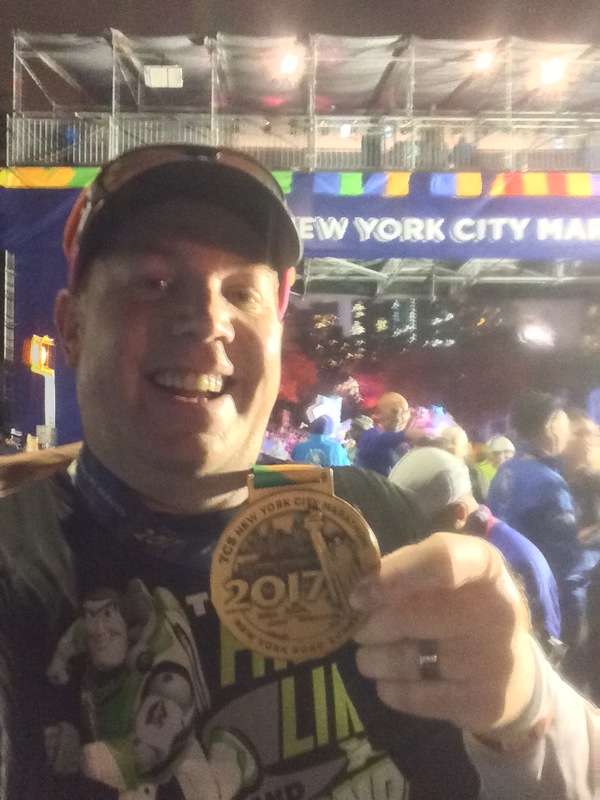 Yesterday was my last time racing by myself before the Disneyland Half. 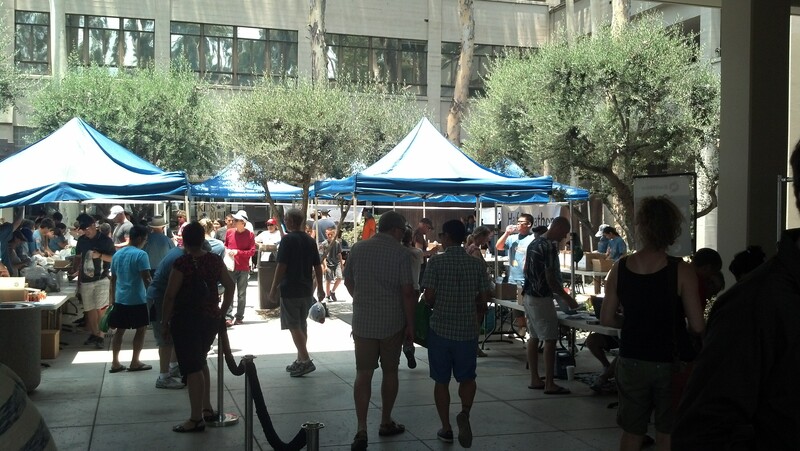 Like many races out there, the Pasadena Marathon had a health expo where you could pick up your race bib, shirt, goodie bag, and check out things that various vendors had on Saturday. This year, it was held at Fuller Theological Seminary. Unfortunately, this event was outdoors on a super hot weekend in Southern California. When my wife and I arrived, the temps were already in the 90’s. So, we did not stay long. I was happy that the race shirt was white. Why? Temps for the race were projected to be 75-85 degrees while the races were going on (and sunny). Since I don’t have a light-colored shirt suitable for racing, I was considering purchasing one Saturday night. Thankfully, because the shirt we got was white, I decided to just go with that. On Saturday evening, I got everything ready as early as I could in order to try to relax so I could get to bed early. I wrote, on a small piece of paper, three columns. The first was my goal time for each mile of the 10K. The second was my 10K PR at the time. The third, my 10K best time in a race. That way, I could see where I was in relation to these times while on the course. With the high temps, I didn’t know if a PR was going to happen. The folks that ran the Pasadena Marathon races sent out email and Facebook messages during the week to remind us to keep rehydrating. They also told us that they were upping their water supply quite a bit and were going to have cold, wet towels for us. So, being the newbie runner I am, I freaked out a little and was very conscious of how much I was hydrating during the week. I even had this plan of how much water I would bring to the race. Unfortunately, when I got to the parking lot, I realized that I forgot the extra water…oops. Sunday morning began at 5am. By the time I got outside, it already felt kind of warm (at least for 5:45am). 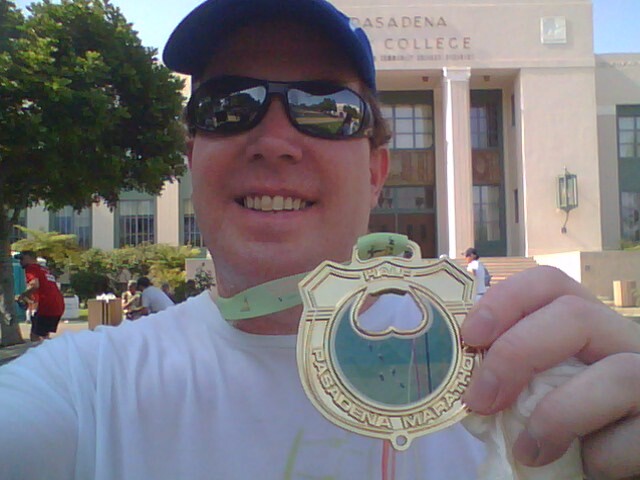 I drove to Pasadena City College (the start/finish line) and made my way to join my fellow runners. My race started at 7am. However, the half marathon began at 6:30 and I wanted to be there for the start of their race. Additionally, I found out, on Saturday, that Linzie Sharp of See Sharp Run was running in the half marathon. So, I was hoping to get to meet him…and I did! After meeting Linzie, I walked around and took a few pics and set up to see the start. Once the half marathoners were off, I made my way to the runners shoot to get ready for my race. The 10K and 5K races started at the same time. The announcer advised that those with an expected pace of 8 minutes per mile to line up in the front. All others, were to line up towards the middle or back. While we were waiting to go, we were also informed that Julie Weiss, aka the Marathon Goddess (who ran 52 marathons in 52 weeks and is featured in Spirit of the Marathon 2) was on hand to run the 5K. I didn’t get a picture because I was lined up too far back. However, that was kind of cool. As I waited to start, the heat was playing games with my mind. I don’t know why. 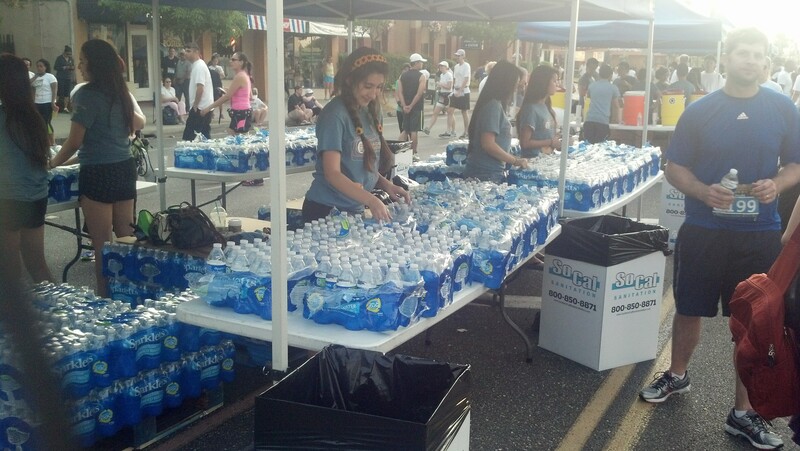 The volunteers had plenty of water for us at the starting area. I drank an entire bottle of water and several cups of cold water while waiting. However, the thought of having heat problems was weighing on my mind. I tried listening to some music to get my mind off the heat. I couldn’t wait until it was time to go. One thing that is great about running is that it’s easy for me to shake the nerves once I get started. Once I was able to go, I knew my mind would shift its focus to taking each minute as it came. Finally, about 7 minutes late, we were off. The people around me were pretty slow. That’s saying a lot coming from me because I’m a slow runner as well. I use the Galloway run-walk-run method for these events and in training. My interval is 1 minute run, 1 minute walk. I did this during the race. In the first mile, however, I was running really slow trying to navigate my way around people. Probably because I was going slower than I was used to, but I started having thoughts of upping the running time after the first mile was over. I felt pretty good during the first mile. One cool thing about the first mile was that we had our only on-course entertainment. It was some kind of Asian drum group. Loved it! They played out their cadence and cheered us on at the same time. I finished the first mile in less than 12 minutes. So, I was very happy. Although, my new Nike Plus GPS watch had the first mile sooner than the 1 mile marker. There was a difference of 0.06 miles. So, I didn’t think anything of it. When we came to the second mile marker, my watch said 2.06 miles. So, I started thinking that my watch might be a little off. Then, the mile 3 marker came and my watch read 2.96 miles. Something was definitely off. One of my complaints of this race was that, after the mile 3 marker, there were no more mile markers on the course. That meant I couldn’t see if this difference continued throughout the rest of the race. More on that later. Right about 1.5 miles, we had our first water stop. I took in 2 cups because I was still paranoid of heat problems (even though I wasn’t feeling anything). Note to self…must learn how to drink water in cups while not loosing too much time. I think it took me about a minute and a half to finish the two cups and move on. I was not happy about that. To make up for it, I ran the next 1 1/2 minutes. The route took us up the famed Colorado Boulevard and back. We did have one detour where we turned off Colorado Blvd. to run by city hall. 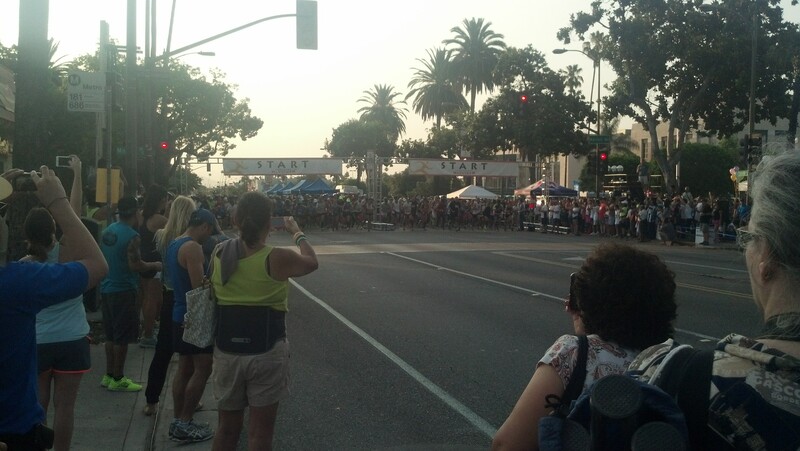 That detour would take us back to Colorado Blvd where the 10K’ers would continue up and the 5K’ers went back. From there, we came across the inclines on the course. Another note to self…must get better on hills. The first hill I was determined to continue on my 1/1 run/walk ration on. However, 40 seconds into the run, I just quit. It was kind of strange how quickly I went from determined to walking. The legs started feeling a little rubbery and I quickly went to walking for the rest of the climb. On the downhill, I ran almost 2 minutes to try to make up for that. When I saw how successful I was at that interval, I realized that the heat may slow me down on this day, but was not going to cause any other problems. Right before the bridge was an additional water station they set up because of the heat. That meant, we would have 4 water stops in a 6 plus mile race. I was thrilled to see that the race organizers came through. This water stop was right before the bridge and close to the 3 mile marker. I knew that at the end of the Colorado Street Bridge was the turnaround. So, I knew I’d be back to that station really soon. Therefore, I decided to forego the water station this time and catch it when I came back. When I crossed the mile 3 marker, I thought it would only be around a tenth of a mile or so before we turned around. I was wrong. We turned around 3.25 miles into the race. I thought this was odd and hoped it meant that we just had a straight shot down Colorado to the finish (without the detour). This was the first time I wondered if this race would be longer than the 6.25 miles advertised. The rest of the race had nothing to really report about. The heat was taking its toll as I felt like I was running slower. Some runners, on the way back, were running up on the sidewalks, near the buildings, in the shade at points of the route. By the turnaround, the race had really thinned out. We were mostly a strand of runners only one or two across. By mile 4 I had crossed over that 12 minute per mile average by 30 seconds. This was when having my little cheat sheet came in handy. I could see that I was still on a PR pace. So, I just went back into focussing on each interval as they came. By mile 5, I was 1 minute over the 12 minute per mile pace. When I crossed that point, all I wanted to do was hold that for the rest of the race. Without mile markers, my watch would be the only way I’d know how far I had to go. I finished mile 6 holding to that 1 minute slower than a 12 minute per mile pace and would hold that for the rest of the way. As I got to 6.10 miles on my watch, I could tell that there was more than 0.15 miles to go. Because it was so hot and I was already slower than I wanted to go, but still ahead of my PR, all I wanted to do was finish. I crossed 6.25 miles on my watch faster than my 10K PR! However, the race was not over yet. I could see the finish and kept to my intervals. However, it would still be around another 0.25 miles before I’d cross that finish line. It felt great to finally finish on that hot, hot, hot day. A woman who finished just in front of me had to be helped to get medical attention. It was just a reminder of how bad things could have gone. In the last half mile, I did see an ambulance driving towards the finish on the other side of the street. It was a crazy hot day. Later, I would learn that 15 people were taken to the hospital for heat related problems. I’m so glad I wasn’t one of them. When you’re a runner, part of the goal is to push yourself. However, we all need to recognize our limits as well. We need to listen to our bodies and realize that, some days, it’s better to enjoy the ride and live to fight another day. I could have pushed myself a little harder yesterday. However, I was paranoid about becoming dehydrated or having some sort of heat stroke. So, I listened when my body said to walk. I pushed as hard as I could and still ended up with a 10K PR! It wasn’t as much as I would have liked. However, it was a PR still. Over all, I would rate this race as a B-. 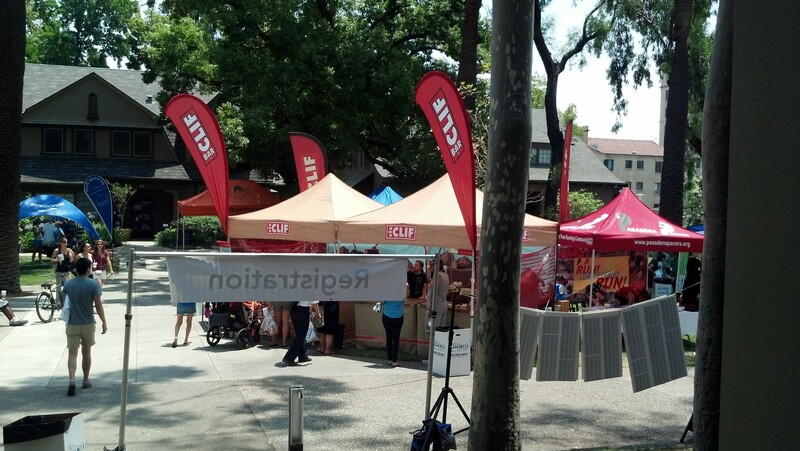 The organizers did a good job at helping us runners out in the heat by adding water stations. The volunteers on course were also awesome. In the last water stop, I saw several pouring water over runners that asked for it. There was tons of water at the start/finish area. They had buckets of ice and wet towels for us to help cool off. There were lots of oranges, bananas, and bagels for us at the finish as well. The finishers medals were awesome! 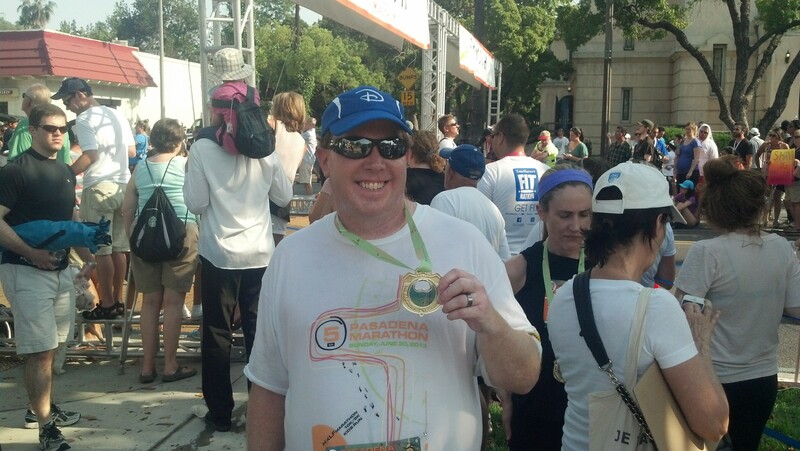 Although, I found it funny that the 10K finishers got the same medal as the half marathon finishers. Apparently, they had 2 different medals. One said “Half” on it and the other said “5K.” So, I got a half marathon finisher medal when I only did a 10K. On the negative side, the race course only had mile markers for the first 3 miles. In a smaller race, I don’t expect to have the running time clock at each mile marker that a runDisney race has. However, the mile markers really help mentally. Also, given the discrepancy with my watch in the first mile, I really wanted to know whether my watch was off or the race markers were not placed accurately. 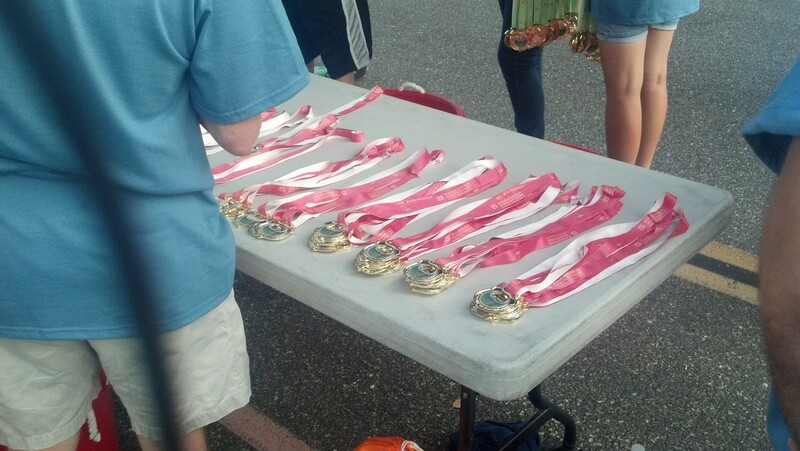 The other negative to this race, I would find out later, is that they ran out of finishers medals. That means that some folks finished and they didn’t get rewarded immediately. The organizers did issue a message on their Facebook page that they would order more for those that wanted them and gave instructions on how to get a medal for those that did not get one. Will I race in this event again next year? Probably. Although, I think I’ll have to go for the half marathon next year. After all, that will show progress…5K in 2012, 10K in 2013, Half Marathon in 2014….right? Crossing the Half Way Mark with a 10K PR! runDisney adds 10K race to Tinker Bell Half Marathon Weekend!